I don’t know why I didn’t cook Greek food more often in the past. I’ve always really liked Greek food, but I felt like I didn’t know enough about it. That excuse is about to become a thing of the past. I received a review copy of Vefa's Kitchen , and this is a comprehensive guide to all types of food from every region of Greece. Central Greece has a rich history of cheese production because sheep and goats spend winters in mountain pastures full of green grass. Messinia, in the Peloponnese, is the country’s leading olive producer, and the mountains of Arkadia are where the best feta is made. Venetian influence on the Ionian Islands is apparent in Italian-sounding dishes like pastitsada, but the cuisine has taken on a character of its own. And, we have the island of Cyprus to thank for lovely, lovely halloumi cheese. There’s a simplicity to a lot of the cooking in that it’s the freshness of ingredients that brings great flavor. Grilled fish with just olive oil and lemon and maybe parsley or oregano is as good as it is because of the fish itself. That being said, there are plenty of complex dishes involving pastry or pasta, but there’s always a clear link to seasonality. I could have focused on the salad chapter alone for days with options like potato salad with octopus, broiled zucchini halloumi and lettuce salad, and grape and lettuce salad with kefalotiri. First, I had to try the fried salt cod with garlic sauce and artichoke soup. I was thrilled when I finally found some salt cod locally since I’d wanted to try cooking with it for ages. I had imagined it would have some aroma as it soaked in water to remove the salt. I let it soak for 24 hours, and changed the water four times keeping it tightly covered with plastic wrap as it sat in the refrigerator. Happily, it didn’t have a strong smell at all, and 24 hours was plenty of time to remove excess salt from this particular piece. After rinsing and drying the cod, which had already been skinned and de-boned, it was cut into chunks. A batter was made from flour, olive oil, beer, and salt and pepper, and that was set aside for one hour. Just before frying, whipped egg whites were folded into the batter before the cod chunks were coated. The crispy, golden fish pieces were served with a garlic sauce made from, obviously, garlic, but also cooked potatoes, bread crumbs, red wine vinegar, water, olive oil, and salt and pepper. I was thrilled with the crunchy, fried cod and the garlic sauce was a nice, although somewhat thick, accompaniment. 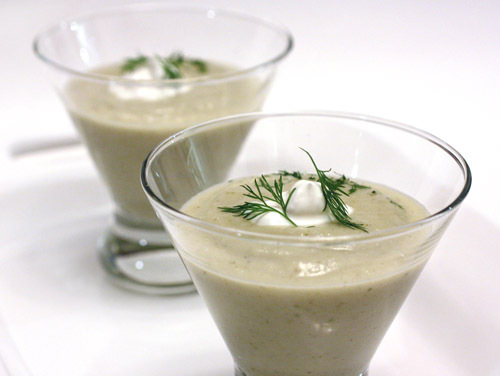 Next, I used some spring artichokes in a simple, pureed, and chilled soup. This was a lot like vichyssoise with the addition of artichokes. Big, green, globe artichokes were cleaned and peeled to the heart and stem and then sauteed with onion and leeks in olive oil. Speaking of Greek artichokes, there was a great story about them with a slideshow on The Atlantic site the other day. Once the vegetables had softened, stock was added along with some chopped potatoes, parsley, and lemon juice. That all simmered for about 20 minutes, was allowed to cool, and was then pureed in a blender. The soup was poured through a strainer and then refrigerated for a few hours. Just before serving, I tasted it and thought it was missing something. That something was the Greek yogurt that was to be whisked in at the last moment. The yogurt’s acidity gave the soup just the zip it needed. The chilled soup was velvety smooth, and the vegetable flavor was spring in a cup. I haven’t even finished reading the book yet, and I already have several pages marked of more things I want to try. Stuffed pastas, chicken pilaf wrapped in phyllo, baked giant beans, and kataifi and cheese rolls are just a few. I’m also really looking forward to using summer’s stars, zucchini and eggplant, in several Greek specialties. I hope to visit Greece some day, and while I’m daydreaming about that, I can learn more about the country through its food. That look soooo good! I'd love to bite in those salt cod fritters! 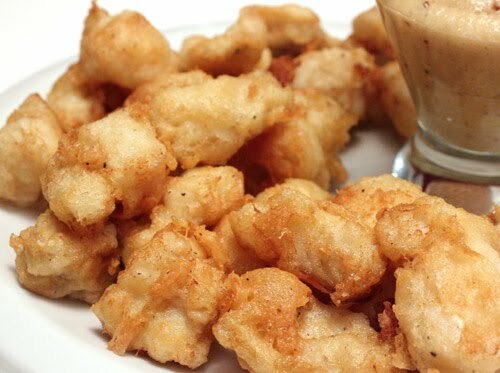 The cod look like little fritter poppers. That plate will not leave my sight until I eat up every last bit of it. hahahaha.... The garlic sauce is a perfect match for it too. The fried salt cod bites look scrumptious and I love the elegant artichoke soup, yum! 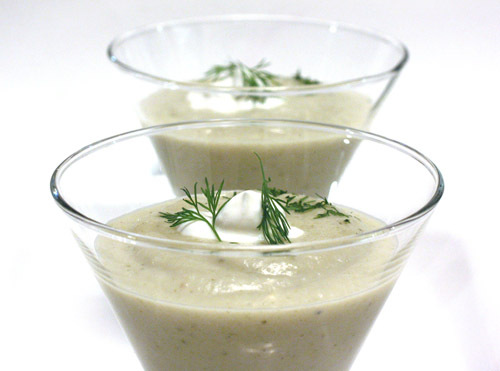 Your artichoke soup looks fantastic! We also love Greek food, but honestly I don't think we've ever cooked it. Don't know why! Your artichoke soup looks so good! Nice photograph of it as well. I love salt cod but have not made it in a long time. 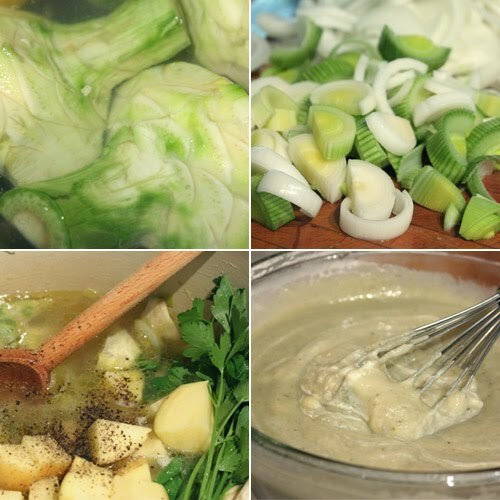 I'm planning to buy artichokes tomorrow at the market, and would love to try your soup, which looks absolutely delicious. Aren't artichokes incredible? The garlic sauce must really complimented the fish! i thought i was pretty familiar with greek cuisine, but apparently i'm not! both of these dishes are extremely unique, and the soup in particular strikes a chord with me. great post, lisa! I also don't cook Greek food enough which is too bad because the flavors are always so simple and fresh...and delectable! That artichoke soup has me drooling over here...I love how seasonal it is. What a great cookbook review! I can't wait to see what else you cook from it....stuffed pasta..hint hint. We loooove garlic. That sauce would so work! Salted cod can be tricky to find, but oh what a beautiful result you have here. I too love Greek food but usually find myself eating it out rather than cooking and I have no idea why. I cannot wait to check out this cookbook. what gorgeous pictures! i love greek food and this looks AMAZING! cheers and have a great weekend!! I've recently gotten more into Greek food as well. Both dishes sound amazing and I love the cute glasses you served the soup in! I love the idea of artichoke soup.....I've never had one....sounds really good. Both dishes look delicious! I love your artichoke soup. Looks gorgeous and creamy-- nice touch to add the greek yogurt at the end. Yum! I just enjoyed some salt cod the other night at a restaurant in Oakland. Only, this was done brandade-style -- whipped with potatoes and browned until crispy on top. Pretty addicting, that's for sure. The fritters are little golden puffs of deliciousness! It's good to hear firsthand how to prepare salt cod for cooking, as I never used it before. The soup looks lovely too! The cod looks really delicious Lisa. I wish I could pull a piece out of the screen to taste! 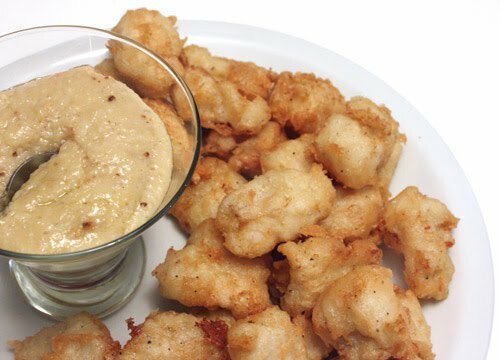 I've never had fried salted cod in little nuggets like that. I think I'd prefer it to large fillets. And I love your artichoke soup too, Lisa! What a pretty presentation-- would be lovely for Mother's Day actually. That cod looks so good as a fritter! I want it, now! I love the soup too; all in all a great meal yet again from you. Wow delicious can I take one please..?